Just got home from St. Paul, MN where 500+ colleagues from more than 30 states and four countries spent three jam-packed days raising our collective spirits and talking about strategies for the future of the volunteer management profession at the 2017 National Summit on Volunteer Engagement Leadership. I came to the conference with cautious hope and am thrilled to report that I left with enthusiastic optimism. Clearly the deadline for this Hot Topic (always posted on the first of the month) has left me with little time to digest everything that I saw and heard, but I very much want to share my impressions and initial thoughts. Consider this a personal debrief – and I welcome any readers who also attended the Summit to post your reactions as well. Undoubtedly I will return to some of these ideas in more depth again, but here are some of the highlights for me. It has been 10 years since we had a national event designed exclusively for people whose work centers on engaging volunteers. At one time we relied on what was the Association for Volunteer Administration (AVA) for such an annual gathering, but when AVA died, so did the conference. The few other conferences available have increasingly pushed volunteer management into a somewhat isolated “track,” while corporate social engagement, full-time service such as AmeriCorps, and courting of elected officials have politicized (and monetized) much of the focus. Veterans in our field who came to the Summit almost unanimously expressed sentiments such as “Wow, the warm, enthusiastic tone here is something I haven’t felt since AVA!” I agree. We have missed this feeling and want to re-integrate it into our professional lives. The staff and members of the Minnesota Association for Volunteer Administration (MAVA) hosted the event superbly (HUGE thanks! ), with a corps of colleagues from around the country volunteering their time over the last 18 months to make it happen (full disclosure: I was one of them). So we proved that we can still produce this sort of event simply because we want to and are willing to put in the time. That said, we are also grateful to some generous and engaged funders who were convinced – under the leadership of Jane Leighty Justis and Betty Stallings – not only to give money but also to come to the Summit and participate fully. Bravo! If you look back at my Hot Topics over the past few years, you’ll realize my frustration and sadness at the deterioration of what we refer to as the “infrastructure” of volunteerism in the United States and also in several countries around the world who used to be key resources for us all. National bodies representing volunteer engagement were defunded and weakened, while many volunteer centers and local networks of volunteer administrators shut down or are on life support. To be clear: I have never been the least bit worried about the health of volunteering. While I am totally dedicated to the belief that competent leaders of volunteers are crucial to supporting volunteers to accomplish more things strategically, especially within formal organizations, the sobering fact is that volunteers don’t need us to get many things done. It’s the synergy of volunteers and effective leadership that works miracles. Those of us with many years of experience – and, yes, I am definitely in that "old fogey" category! – have somewhat despaired at the dismantling of professional networks and in-person platforms for collaboration. Several months ago, Greg Baldwin, president of VolunteerMatch, said to me in a phone call, “Susan, it doesn’t matter what happens at the Summit, as long as the right people come to it.” Hooray!!! He was right. We saw extraordinary new, younger talent surface in St. Paul last week (some of whom are mentioned below and I will report over time about others). The Old Guard can finally relax and cede our efforts to a wonderful New Guard. Smart, bright, diverse professionals with many backgrounds. And most important, they proved willing to speak up and out – and to offer their energy to the cause. Thank you to those who attended the Summit – and encouragement to the others out there who will rise to the surface if we continue to provide opportunities to gather together and get acquainted. One of my personal objectives for this event was to finally meet in person the many great bloggers who have stuck their necks out to post their thoughts and teachings about volunteer management on the Web. So we scheduled a pre-conference “affinity group” meeting for current bloggers and it was wonderful! About 20 of us met for three whole hours, with Jayne Cravens (Jayne Cravens Blog) and Carolyn Appleton (Carolyn's Nonprofit Blog) joining for the entire time remotely via Google Hangouts. Here’s a shot that Jayne took of us from her screen at home(! ), l to r, front to back: Lucas Meijs, Elisa Kosarin (Twenty Hats), Meridian Swift (volunteerplaintalk ), Liza Dyer (Volunteer Management Snark), Susie Reehl, Kylah Martin (@wherechangestays), Albert Arevelo (@BertWheresErnie), Jennifer Weichel, Rob Jackson (Rob Jackson Blog and Third Sector UK Voice of Volunteering blog, me, Marla Benson (Volunteer Relations), Erin Spink (spinktank), and Mary Anne Casey (Retire For Good). Everyone immediately clicked (no pun intended), and we left the room with plans to create a LinkedIn group for further discussion, explore forming a volunteerism blog “ring,” find ways to join forces on special news and issues confronting the field, and more. Stay tuned! The Summit ended at 2:00 p.m. on Friday, but participants had all been invited to reconvene an hour later for a more intense strategy planning session for what might keep the momentum of the Summit moving forward. About 75 colleagues fought the fatigue of long conference days, rolled up their sleeves, and spent two hours debating next steps. Common ground: We simply must keep moving forward and harness the incredible enthusiasm and optimism of the Summit. We committed to holding regular conferences like this Summit, at least every other year, with a “backbone” coordinating body but sharing hosting/organizing responsibility with existing strong state associations and local professional associations in different locations. This is do-or-die time for AL!VE, the Association of Leaders in Volunteer Engagement. It has struggled up to now to take root, but its leaders came to the Summit with the clear goal of being an important part of what might come next. The current president was a key Summit planner, the incoming president and several board members attended the entire event, and many AL!VE present and past members were in the room for this post-Summit strategy session. By the close of the strategy session, it was decided that AL!VE will spend the next three months coordinating and convening several task forces formed to continue working on ideas raised. There was also consensus that we want to grow the membership so that volunteer management professionals truly have a voice backed by the clout of numbers. Be a part of determining the future of our profession. Join to show support. Be counted. Keep informed. Participate. Volunteer. The first step, even if you do nothing else, is to JOIN. Bravo for showing technical competence! The Summit created a great cellphone app that was very powerful. It contained the entire schedule (with room locations, handouts to download, and instant evaluations), the conference attendee list, and even a way to do polling in the plenary sessions with real-time responses projected for all to see. The “funders” track brought together foundation leaders and major donors with practitioners –- and they really talked with each other! 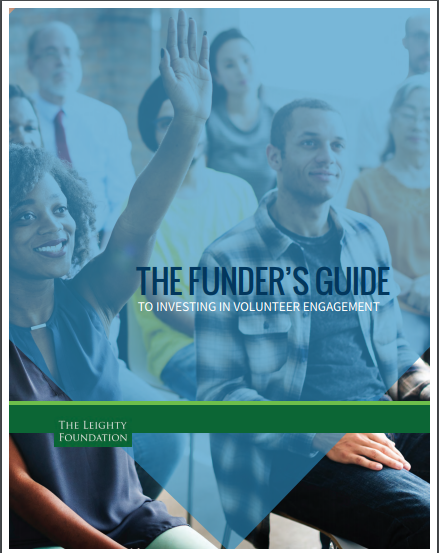 In preparation, The Leighty Foundation has created a Web site dedicated to educating funders on “Why Invest in Volunteer Engagement?” Download The Funder’s Guide to Investing in Volunteer Engagement, the Foundation’s new, free booklet that I hope we all share widely. Thank you, Jane! My favorite quote of the Summit came from Liza Dyer who remarked, “Criticism is a form of collaboration.” We need voices, not silence. 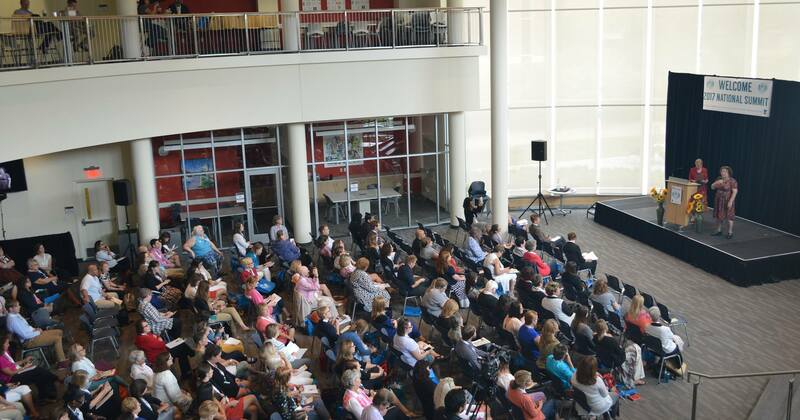 If you attended the Summit, please share your reflections. If you could not attend, do you have a reaction to anything here? I have been waiting for your post-summit hot topic! I really hope others will blog about the experience and their next steps. It was such fun to participate in the summit remotely. Kudos to Rob Jackson for doing a stellar job of tweeting from the summit, and to everyone who used the official summit tag on tweets, #2017NationalSummit, so that those of us not there could check in and see what was happening. In addition, if someone doesn’t update the Wikipedia page for ALIVE with more up-to-date activities and citations OTHER than the ALIVE web site, the page is going to get deleted - it's been flagged for such. The loss of AVA and its annual conference hurt not just managers of volunteers, but all volunteerism – there was no one who was championing the people in charge of creating tasks for volunteers and supporting volunteers in those tasks, and there was no one advocating for the resources those people need to do those jobs. I believe it’s why it’s been so hard to refute claims that the best way to measure volunteer value is by giving a monetary value to service hours, and why, in this era where everything is about community engagement, managers of volunteers at nonprofits have been largely left out of the conversation. I hope the summit leads to real change and new leadership. Thanks, Jayne -- there are certainly MANY things to be done. Hope we can maintain the momentum of the Summit. Whether or not people were able to attend last week, the important thing is to get involved now -- and stay involved. As someone who was also at the Summit, I loved this Hot Topic! It mirrors many of the feelings that I have after attending and was a great way to start my first day back in the office. Also, thank you for mentioning me in this post, Susan! It was awesome meeting you in person and I'm excited to keep the momentum going. One of my biggest takeaways was that this gathering needed to happen and we have to make connecting with colleagues (locally, nationally, internationally) a priority. I'm including "become a member of ALiVE" on my to do list this week and I hope others will, too. Let's roll up our sleeves, invest in our people, and do the work that needs doing. You are most welcome, Liza. And hurrah! on your determination to move forward. The Summit was wonderful. This was the third conference I attended this summer (Points of Light Conference on Volunteering and Service and a regional CNCS National Service Training Conference). The Summit was by far the most useful and the most hopeful training I have availed myself to in years. I was accompanied by two staff members and we attended a variety of sessions. I can't think of the last time I took staff to a conference and we didn't end up attending the same sessions. It was worth the expense and the misery of air travel. I found it consoling to focus on opportunities to improve our program and provide greater support to our volunteers and the organizations with whom we partner. I appreciated the opportunity to spend three days increasing the knowledge of my profession rather than refining my list of the three most likely ways our program will be forced to close. I will budget (and raise funds) for the opportunity to take the entire staff (all 5 of us) to this type of conference in the future. Yay, Susie! So happy the Summit was a success for you and your colleagues. And it was lovely to meet you in person (maybe we'll soon see you blogging??). I am so grateful to have once again attended a national conference that focused on leaders of volunteer management. My office sponsored the attendance of four staff involved in volunteer engagement from my agency. We attended sessions and spent about 2.5 hours yesterday debriefing amongst ourselves. I am a 25+ year veteran of this field and have always felt a tension between spending energy on the discipline of volunteer management vs focusing on my field - which is Parks - and I love both. It's not an either/or (yes/but? ), but I have toggled between professional development through Parks conferences and Volunteer Management conferences. We are a unique profession that needs both to be effective. I missed AVA more than I knew, although for me AVA only became very valuable when we had an affinity group - MOVE (Manager of Volunteers in the Environment). I see now that I took for granted that there would always be a national conference or how very important that turned out to be for my agency. I would love to see an annual event and I have energy to help, especially if we can accommodate tracks for affinity groups. I would push back on some of the themes I heard - one recurring one was there's no difference between volunteers and donors. And while I believe I get the truth of that, and I LOVE the research that was provided that certainly clearly demonstrates a high level of overlap, I didn't quite get the need to take it to such literal levels. However, I really loved connecting the fund development community and the volunteer community as there are links and overlaps that can and should be explored in many situations. I am struck at the rise of organizations - generally interest advocacy organizations - that seek to engage volunteers not as part of a service delivery strategy, but rather as a means to another end. The point is to have volunteers because they make good advocates and/or donors - so the work is finding them something to do in recognition that the payoff is the other benefits they provide. This is in such opposition to my paradigm - we rely on volunteers to be the staffing resource that allows us to provide more and better services. But that doesn't mean it's not a legitimate perspective. I felt the same odd feeling with all the discussion about volunteer/donors. I hope as we go forward, we make sure that we are relevant to all perspectives. I distinctly remember feeling run over by the Americorp movement and I do not want advocacy or donor "engagement" to be the next trend that eclipses solid volunteer management basics. I want to say thank you in particular to Jane Leighty Justis for more reasons than I can name. I am at a point in my career and life where I feel a bit invisible. I am not the young newcomer, I am not part of the "Old Fogey" (Your word Susan) gang. I've been doing my best to advance the mission of my agency through the effective engagement of community volunteers for most of my life. There was something about her simple, common sense and confident demeanor and her CHOICE to recognize volunteerism as a critical element of infrastructure that made me feel valued and valuable. I think she should be commended for connecting the dots, championing research and directing funding to our discipline, especially at a time when we weren't doing it for ourselves. You're a hero! Finally, thank you to all who joined together to make this happen. We came away with great ideas and thoughts and energy as well as some great contacts and resources. We will explore joining ALIVE although I must admit I really don't know much about them. But I will go look! Thanks Susan. You've added some great relections and I join you in applauding Jane Leighty Justis. Just a comment on your concern for not seeing donors and volunteers as "the same." Of course they are not, BUT even though there are differences, there are also important similarities and connections. I dealt with some of them in a past Hot Topic, "The Correlation between Time Donors and Money Donors." And it doesn't hurt to sometimes refer to volunteers as "time donors" or "skill-anthropists," if only to make the case that they provide substantial value to the organization. Further, it isn't either/or. One of the sessions I presented at the Summit was about the continuum of supporters every organizations needs -- and that people can move around on that continuum over many years in many ways, including giving money and time. I wasn't at the conference but it does my heart good to hear of such a successful dynamic event. Many years ago I attended a volunteer management event in Buxton and was privileged to meet Steve McCurley Linda Graff and rick lynch and what I learned inspires me still every day. I am so thankful that being able to liberate the efforts of volunteers had so enriched my life. The energy and enthusiasm generated by the Summit was so impressive. And judging by the turnout at the Friday wrap up/planning session, it looks like we have the person-power to maintain momentum. As Meridian Swift suggested in her blog this week, we are stewards of this profession, and our actions have an effect on the future, for better or worse. Personally, I look forward to collaborating with fellow bloggers. It's time to expand our collective voice. Thank you, Susan, for responding to the Summit with such clarity, insight and hope. I stand with you as I have for so many years when we tried to make this event happen. Thanks to MAVA for taking the risk this year to allow the Summit to be a part of their excellent state conference. MAVA volunteers and many national leaders have volunteered their time for 18 months to make sure this event was all we had hoped it would be. The power of volunteering has never been more obvious. From design, marketing to implementation..... the event was a great success!!!. Many asked what would look like success to me and my answer was that new leaders would step up in creative new ways to take the profession forward. And they did, indeed. Watching leaders like Betsy McFarland, and so many others, say yes to the challenge and participate in leadership roles in the conference was beyond my wildest dreams. I had the privilege to work closely with Jane Justis of the Leighty Foundation as we tried to expand our table to include funders in the dialogue. Funders not only stepped up to the plate to fund the event but many also participated in a dialogue which was rich and fruitful. One funder said..."I have never been to a conference where I felt such passion and professionalism combined." We must continue to include funders as part of the philanthropy we are all involved in. I agree with so much of what Susan has so eloquently expressed and just wanted to say a great big thank you to all who made this Summit a time we may look back on as the event that shaped the future of this important leadership we provide. My role in the future will be to support and applaud efforts as we move forward. Having spent over 40 years in this profession, I can't really retire but my role is changing and I am delighted, beyond your imagination, that such talented, young leaders have pledged to carry this movement forward. I saw the ad for this conference here on Energize and I am very grateful. I have been a volunteer manager off and on for over 35 years and this was the very best conference on volunteer management I have ever attended. I didn't know until I read your article that this was almost the only one out there, but I sort of felt that and every time I got the chance I encouraged the leadership to do this annually. WE NEED THIS! I only attended one session that was a stinker. I carefully reviewed the sessions and chose the ones I needed most. This one on online training was on the top of my list because I am actively going to that process now. It was not even addressed except to say that we should not do it. :( But ALL the rest I attended was stellar! Fantastic, wonderful, glowing, great and top notch. Did I say that I enjoyed them very much? Please, please, please keep this up! Please! I enjoyed myself very much, made great connections, and met very knowledgeable presenters who knew their stuff. They were timely, up to date, had great suggestions for tech tools and not so tech tools. Yesterday I purchased the 55 Minute Training for Staff and got permission to use it with our staff leading them to better staff volunteer relations. Thank you so much MAVA for your fantastic conference. I would gladly make a commercial for you! Susan Detweiler, veteran volunteer manager. Sooo happy that the Summit was such a success for you, Susan. Special commendation for the very smart move to make an appointment with your ED and discuss what you learned! He therefore gets more educated, you get more resources for volunteers, and you have an excellent chance of support to go to another conference! A note to all readers: Have you shared your ah-ha! moments at the Summit with your executive yet? It's not too late! I was not familiar with ALIVE. It looks like a useful network for career coaches who encourage their clients to gain new skills by volunteering. As a former volunteer manager, I believe passionately that volunteering can be a critical piece of advancing your career. Thanks for this post, Susan! I am thrilled to read about the wonderful event. While my participation in the volunteer field is as a volunteer these days, I care deeply for your work and the work of others in this field. Hurrah for 500 people and for the future of improving volunteer engagement. The National Summit has just released its official report. Take a look at www.mavanetwork.org/summitreport. Susan, your hot topic, and the reviews people wrote about the conference in MN renew my hope that the field of Volunteer Management as a credible professional field, and choice will again gain respect among grantors and corporations. Hopefully next year I will be able to attend. As a colleague previously wrote, professional volunteer managers need information directly relating to best practices in our field, and speakers who can motivate us (and newbies in the field) to move forward engaging our agency leaders and colleagues to embrace volunteer engagement as a way to expand and add value to the programs and agency mission. Can volunteers become donors? Of course they can and do, but my ultimate goal remains to engage passionate people who believe in our mission, or feel strongly about volunteering in one of the areas we offer. Anything additional becomes a gift. I am so thankful I had the pleasure to meet you and to learn about Energize, Inc.! You are my new sensei! I came to the summit knowing a thing or to about volunteer engagement, left with some more and there is still much more to learn. I've been spending my Friday learning so much from your site. At the next volunteer round table in Colorado Springs I plan to share my experiences at the summit and the amazing resource which is you and your website! Someday hope to have meaningful contributions towards how food banks view volunteer engagement across the nation! What lovely compliments, Eric! Thank you so much. I'm always gratified when someone discovers our site and finds benefit from it. 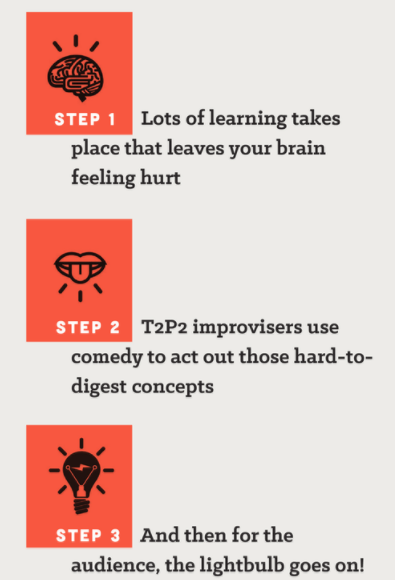 We continually add new information -- and you, too, can share resources that you like. Also, if your volunteer roundtable in Colorado Springs wants to do more in-depth learning, you can enroll as a "team" in the Everyone Ready online volunteer management training program. So glad you let the Summit "energized." <grin> Thanks for posting. The excited buzz of this Summit reaches way down here at the bottom of the world. I am reminded of the Retreats for Advanced Volunteer Management organised by Andy Fryar and Martin Cowling, held in Australia (and one in New Zealand). They were great occasions, and I miss the opportunities they gave for collective reflection to take out to the world. Hi, Sue -- Yes, over the last 20 years or so there have been many wonderful gatherings in many countries around the world, almost none of them still happening. There are lots of reasons for this, especially cuts in the budgets of national and regional organizations focused on supporting volunteerism. But, in the last analysis, gathering together can happen simply because fellow colleagues WANT to do so and are willing to give some of their own volunteer time to organize them. We tried to prove that with the Summit, which was almost entirely planned, coordinated, and run by devoted practitioners through donated time (the funding obtained happened only once it could be demonstrated that the event was something real). You and I are in the "old guard" (chronologically gifted) -- take heart that there are new thought leaders coming up the ranks, but they need forums to rise to the surface and interact with each other. Thank you so much for providing a link to the 2017 National Summit on Volunteer Engagement Leadership in St. Paul. I appreciate the comments from your readers from the perspective of both the planner/organizer/presenter and attendee. I have presented at several conferences for the NJ Governor's Conference on Volunteerism, and for our State Library's Lunchtime Learning series. I also designed and implemented a conference for international members of a professional radio reading service association. Organizing an entire conference is a LOT of work, especially with a very small staff (or no staff at all). I agree however that this platform for sharing information, networking and support is critical for the survival of our profession. I plan to become involved (even if remotely) in a future summit. Kudos to everyone involved and much applause for you, Susan, for insightful and inspiring Energize Hot Topics every month! Thanks for your nice words, Karen!